Enrique Iglesias thanked his fans for their support as he is recovering after reconstructive hand surgery. The 40-year-old singer had his fingers sliced as he grabbed a drone during a concert in Mexico. 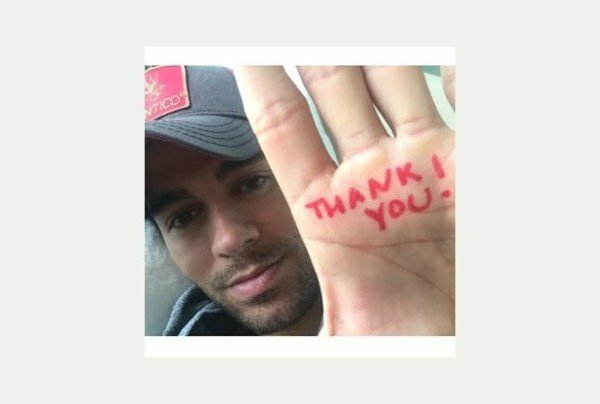 With a red “Thank You!” written in the palm of his unharmed hand, Enrique Iglesias used his Instagram page to show his gratitude by offering to answer their questions. Enrique Iglesias replied to a fan: “My hand is getting better little by little. Enrique Iglesias underwent reconstructive hand surgery in Los Angeles after he grabbed a drone flying over the stage in Tijuana, Mexico, slicing his fingers.